Looking at the metrics for our Live Chat app, I knew that things didn’t look good. We had tried a number of tests and campaigns to drive usage of the app, but ultimately, we were fooling ourselves. Our Live Chat app simply wasn’t that good. And it was costing us: each week, our developers would spend precious hours fixing bugs and supporting an app that our customers didn’t love. Live Chat has been a huge part of Groove since we launched; we brag about it on our marketing site, we talk it up to our customers, and we know how valuable chat can be in delivering great support. But the more we looked at the evidence, the more we realized that we weren’t proud of the Live Chat app. We were proud of having a Live Chat app. It’s a key difference, and it kept us from making the decision to kill the app for far too long. I hope that by sharing our experiences making the tough call to discontinue a major feature, you’ll be less likely to make the same mistakes we did for so long. 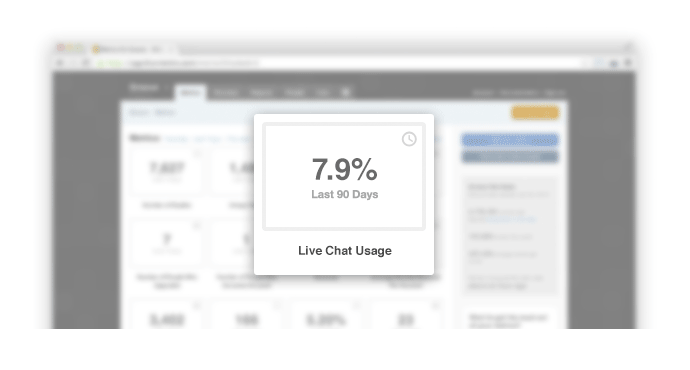 Looking at our user metrics, the adoption rate of Live Chat was, frankly, embarrassing. Compared to our other apps — Knowledge Base, for example, has nearly seven times more users — chat simply wasn’t connecting with customers. The app, built as an add-on in our first iteration of Groove, had more than a few bugs that impacted our customers. As a result, our developers would spend more than ten hours per week working on fixes to Live Chat, at the expense of spending time improving on our core helpdesk product. The resources that Live Chat was eating up were massively disproportionate to the benefit our customers — and our business — got from supporting it. As we considered and debated the future of the Live Chat app, we spent hours testing competing products, including Olark, SnapEngage, LiveChat and others. The reality was quickly pretty clear, and we realized what should have been obvious from the start: the companies who focused 100% on building the best chat product on the planet were doing it better than us. Their products were more stable, more functional and simply superior to ours. And in hindsight, of course they were. These companies live and breathe live chat the same way that we live and breathe helpdesk software. If we compared Groove to a clip-on helpdesk app from a company who’s focused on something else, it’d be ridiculous if our product weren’t vastly superior. The biggest benefit that our app had over competing chat apps was the seamless integration with Groove. We’ve learned that integration partnerships are a huge driver of new customers and awareness. Our partnership with HipChat has led to customers adopting Groove that may have never found us otherwise. And when our developers looked into the competing products, we concluded that there’s no reason we can’t make their integration with Groove as seamless as our own Live Chat integration is now, only with a better chat product. By choosing to keep Live Chat in-house, we were not only offering an inferior product, but we were passing up the opportunity to build mutually beneficial partnerships with some great companies. While we certainly had an emotional tie to the Live Chat app, looking at the evidence made it pretty hard to defend. It was a tough decision, but in the end, we simply couldn’t justify letting our customers settle for an inferior chat experience, and letting ourselves settle for passing up an opportunity to deliver more value through a partnership than we could deliver on our own. Yes, these changes are often made to improve the business — and in turn, to allow the business to improve the value it delivers to the customer — but painting cuts as 100% positive is disingenuous at best. Of course some people will be disappointed. 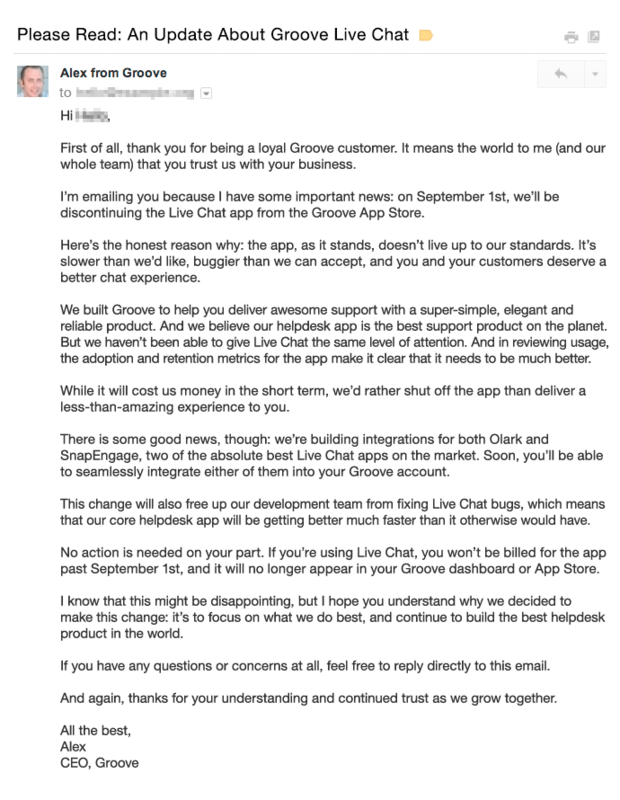 I truly believe that this change is in the best interest of ALL Groove customers (including Live Chat users), and I wanted that to be absolutely clear to them. But the reality is that by doing this, we were disappointing some of our customers, and we had to own up to that, too. And yes, some customers were disappointed. But I went back and forth with several upset customers, and nearly all of them came around to seeing why we had to do what we did. In fact, one trial user even signed up for a paying account after our exchange. We also got more than a few emails from customers who were hugely supportive of our decision. In the end, the backlash wasn’t nearly as severe as we feared, and we were excited to see so many customers support this change. Without a doubt, this change is a bummer to some. But having a very clear 12-month goal makes our decision much easier. If we want to help 5,000 businesses by the end of the year, we need to keep our resources focused on on that goal. Live Chat was not a good enough product for us, or for our customers. And as much as it hurts to cut off a part of the app, we needed to. So we’re going to leave chat to the companies that do it best, while we continue to focus on building the best damn helpdesk on the planet. It’s hard to let go of features and products that you think make your product better. Sometimes, as in our case, the tie to that feature is emotional, and that can make the veil over your eyes that much thicker. But I hope you’ll take this opportunity to look very closely at every single feature in your product. Live up to the standards you’ve set for your business? Deliver more value to your customers than if they were using a competing product for that feature? Deliver more value to your business than the resources you spend to support and maintain it? Clearly have a direct impact on you meeting your goals as a business? If the answer is “no” to any of those, it might be time to make some tough choices.